"Isackson did not play competitive soccer before matriculating at UCLA, prosecutors say, and yet for an entire season she was listed as a midfielder on the roster of a team that finished the 2017 season as runner-up to national champion Stanford." When she was admitted as a recruited soccer player in June 2016, a UCLA student-athlete admissions committee required she play on the team for at least one year, the indictment says. And so Isackson — who prosecutors say lacked even the modest accolades listed on her biography — was given the No. 41 jersey in 2017 on a team of all-stars and pros-in-waiting. Every other player on the roster was assigned a jersey number between 00 and 28. 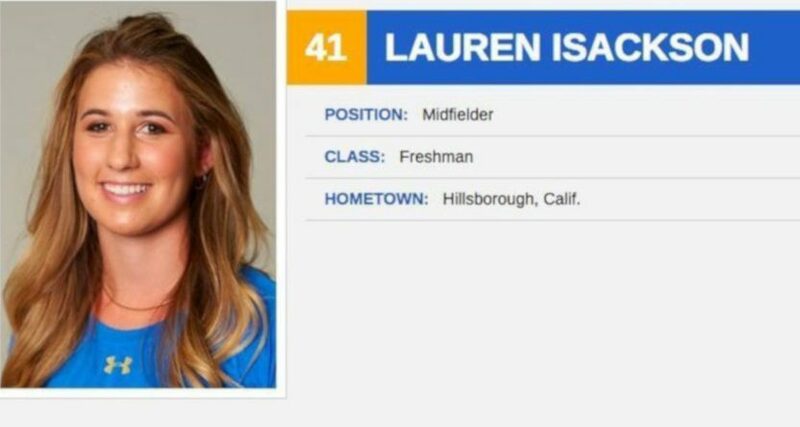 Isackson did not play competitive soccer before matriculating at UCLA, prosecutors say, and yet for an entire season she was listed as a midfielder on the roster of a team that finished the 2017 season as runner-up to national champion Stanford. Her profile on a Pac-12 website says she made no appearances and played no minutes during the season. …A 2017 media guide describes Isackson as a practice player. According to her UCLA biography, her “greatest athletic thrill” did not come on the soccer field, but on horseback, when she became champion of her riding division two years in a row. Isakson is not on the team’s current roster. She is still a student at UCLA, according to [university spokesperson Tod] Tamberg. Of course, this scandal has already seen other fake recruits associated with high-profile programs. One of the most notable is the USC water polo team, which saw coach Johan Vavic indicted and fired; Vavic led the Trojans’ men’s and women’s teams to 16 combined national titles. But the Isackson story is particularly notable considering how she actually wound up on the team (for some level of “on the team”). And it’s also interesting considering that current UCLA women’s head coach Amanda Cromwell wasn’t listed in the indictment. UCLA spokesperson Tamberg blamed currently-on-leave men’s soccer coach Jorge Salcedo (who was indicted on charges of conspiracy to commit racketeering) for “submitting a falsified soccer profile” for Isackson. What’s really interesting about this story is how it extends the scandal to a team whose coach hasn’t yet been indicted, and how it illustrates that even one of the best teams in the country wound up with a fake recruit who appears to have actually had no noteworthy experience in the sport in question. And that raises questions about if this story could maybe go even further. Yes, there have already been a ton of parents and coaches caught up in these indictments, but this is all thanks to one particular “college admissions consultant” (William “Rick” Singer) flipping. If it’s possible for a national championship-calibre team to hide someone who’d never played competitive soccer on its roster, that perhaps suggests there might be even more other not-so-athletic athletic recruits out there.